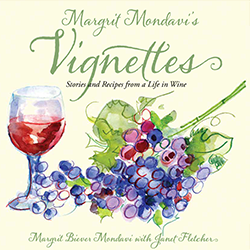 Margrit Mondavi's Vignettes is a collection of previously untold anecdotes from her extraordinary life. Illustrated with her whimsical art and seasoned with recipes that had personal significance, the book allows the woman, whom many consider Napa Valley's grande dame, to reveal a little bit more of herself. Margrit has an astonishing memory and a journalist's eye for details. She recalls long-ago events and places in vivid color, from her first thwarted attempt at cooking Thanksgiving dinner to her subterfuge following a facelift; from the exotic camel market in Kashgar to a penthouse hotel suite in London, the setting for a madcap scene with her husband. All twelve stories involve a bottle of wine in some fashion; in a leading role in some of the tales and as a bit player in others. It's apparent from these vignettes that Margrit embraces life with enthusiasm, curiosity, an open mind, a love of people, and an unflagging sense of humor.